We mentioned in our last blog post that www.myleenterprise.com is alive again and our blog can be viewed there too. Previously, we had our website pointing to our domain back in Year 2015 and we even did a launching for the website during our Myle Enterprise’s 2nd Year Anniversary Event. Then for the past year in 2016, we created our blog and decided to use the blog platform at Blogger as our website while we kept our domain, though it was not pointing to the blog. If you are running a business, you would benefit by having a website. Freelancers, small business owners, entrepreneurs, companies and anyone providing services or selling products would benefit if they have a website. You can list down your services or show your products online so that people can view them. You can even create a website or webpage dedicated for a particular event. Some event websites even include a counter to countdown to the event date. Your website should describe what you do and have your contact details. You can choose to create your own website or you can hire a web designer to create it for you. If you are not familiar with technology and would not want the hassle of creating your own website, then it would be better for you to hire a web designer to do it for you. There are a lot of templates and ready-made designs available online nowadays, so you do not really need to know how to code to create a website. You would still need to know what you want to include in your website and what your website is for. Here are a few things to consider and some steps in order to create a website of your own. Have clear purpose on what your website is for and what you want to be included in the website. For example, if your website is for your business and you want a simple one-page website to talk about the history of your business, what you sell and your contact information then ensure that you built a website based on this or tell your web designer that this is what you have in mind. Domain is your web address that you choose such as www.myleenterprise.com or www.______.com. It would be professional to own your own domain name especially if you are running your own business. Choose a domain name that would reflect your business name or something as close to it as possible if the domain name you want is already taken. You would need to register the domain name and yearly payment is needed. If you do not renew your domain name, you will risk losing your domain name if someone else purchases that domain name. You would want to choose a reliable hosting platform as you will have your contents and information stored at the hosting platform. It would also be good to choose a hosting platform that offers good support with relatively fast replies and especially one you can communicate with, in particular if you are creating the website yourself as you might run into some issues during the creation stage. There are plenty of website builders available nowaday and it usually have a drag and drop system to create your website. This means that you can select what you want to include into your website and drag it into a template of your website. A Content Management System (CMS) is a software that allows you to log in to their CMS platform’s website, design the outlook of your website and add contents such as blog posts. Examples of CMS are WordPress, Blogger and Joomla. Examples of website builders are Wix and Weebly. Blogger has the most basic outlook and it is mainly used for blogging purposes as it is very easy to manage when uploading blog posts. Website builders save your time to create a website with the drag and drop functions and if you are in a hurry to create a website, this would be your choice. WordPress has functions of both a website builder and CMS. You can install plugins which have functions like drag and drop, and you can upload blog posts in there as well. It would require you to have some knowledge on using their functions to build a website and it takes time if you want to build a website suited for your needs and includes something different from what is found in their templates. You can always experiment and there are support or forums found online if you experience some issues while building your website. You can choose whether you want your website to look classic, elegant, modern, dark or fun. You can also choose how many pages you want in your website. If you are selling services or products online, you can include e-commerce functions. Keep in mind that you would want your customers to easily navigate around your website, so keep it user friendly. Nowadays, there are a lot of people using mobile phones or tablets to view websites. Always check that the template you choose is mobile and tablet friendly. The contents of your website should load neatly in either desktop, mobile or tablet mode. You must include what you do and state it very clearly in your website. Have you ever visited a website and you have no idea what they do or what they are selling because it is not stated in their website ? There is no point for you to set up a website and waste your time or money on it if you do not tell your viewers, who are your potential customers, what you do. Another important part you must include in your website are your contact details. If your potential customer is interested in your service or product, they would want to contact you. Not unless you have a system which lets them complete the purchase of a product in your website without needing to contact anyone, it would still be useful if you have a contact number or e-mail displayed in case they need more information or they run into any issue during the purchase in your website. You can always include a contact form in your website where you customer can include details or their comments to be sent to you for your reply. You might want to consider putting some pictures up in your website to make it more interesting. It could be pictures of your business, your previous events, your products, your staff or about your company. You can also include a story of your business or a history of your company. Your website should be easy to maintain after it is created. There should be a system where you can easily update your details if there are any changes. It should also let you easily upload your products or your blog posts, if you have a blog in your website. We hope you find these tips useful. Remember that your website should serve your business well to help you let more people know about your business and to reach new customers online, so build a website which can serve that purpose. We see so many videos on our social media platforms’ news feed nowadays. Sometimes we are so overwhelmed with too many videos popping up on our screen that we just click the skip or close button even before the video loads. If you are using social media platforms like YouTube, sometimes they will show a short preview of a few seconds before the skip button is available. At times the skip button does not exist and we have no choice but to watch the video. If you own a business, you would have heard of using video campaigns to advertise your business. So, how do you keep them watching the video preview and not press the skip button ? According to a research and article on a Google website called Think With Google, a 30-second advertisement would fare better than a 15-second advertisement of the same brand. The 30-second advertisement would see a higher view-through rate as compared to the 15-second advertisement. A 2-minute advertisement was also seen to have a higher view-through rate as compared to the 15-second advertisement. This is surprising because people nowadays have short attention span and if we cannot tolerate a 15-second video, how can we prefer to instead sit through 2 minutes of advertisement by the same brand? Apparently, shorter advertisements can raise awareness about a brand but longer formats can “persuade people to change how they think” according to this article. The video would need to capture the audience with their storyline and yet be able to get their message through to them on their brand. If you have a good storyline, you can reach out to your audience and tell them the story which you have chosen to show what your brand is about. Some brands may have good script writers and some brands may choose to advocate a strong message for a cause they support. We have seen some serious, high end brands which would normally go for sophistication, infusing humour into their advertisements and some brands are just serious about creating humour in all their advertisements. Talking about advertisements, Myle Enterprise have never created a video advertisement for ourselves. We have a number of videos we have created for our events and blogs but not a particular video ad about our brand. As our core business is in events, we usually create awareness and advertisement for ourselves by creating events. Our anniversary is coming up very soon this month and so we decided that we will have our very first ad. It is our fourth year of being established this year, so we must have our own video ad ! We tried our hands in the 30-second video ad as our intention is to create brand awareness. Honestly, we have so compiled so many marketing materials of pictures and videos throughout these few years and we have a hard time choosing only a handful to fit into the 30-second ad. We are so grateful for all the materials compiled but we have to pick the ones that would portray our brand well and what we do. A short 30-second ad took us a while to create and we have to keep editing to keep it 30 seconds short. We can imagine trying to create a 15-second ad – with the limitation to the contents due to the short time and having to make the impact in such short timing, we respect those who did it. However, as research shows, the view-through rate is not good for that type of ad, so the 30-second ad is perfect for us now. When you run a business, you are bound to meet clients or customers who can be really nice and some who can be on the other end of nice, which is nasty. There are those who delay the payment for the longest time and worse still, some do not pay up when all the work is done. This can cause a ripple effect and if you are a company which hires freelancers or external workers on project basis, then their payment can be delayed too. Some companies might pay their workers first before receiving final payment from the client, some might not so it depends on the company itself. Recently we encountered a customer who does not want to pay up for an event we organised for them which happens to be their private party and also in conjunction with the closing of a certain long standing business place in Penang, which we do not want to mention specifically here. Some people have claimed that bigger companies will take longer to pay but we have done some reading and based on our experience, it is not necessarily true. We have dealt with some international organisations which can be found worldwide and they pay promptly; there were some corporate companies which took slightly longer to pay due to their financial hub being situated in another country like the United States of America. No one likes to chase for payment owed, it is unnecessarily tiring. So, what are the steps to take when you are faced in a situation like this ? Before you accept a customer’s job, always take a deposit or if possible, get the payment in full. This was also mentioned in an article by the Young Entrepreneur’s Council at https://businesscollective.com/how-to-handle-clients-who-wont-pay/. It would also be wise to ensure that you have a contract signed between the parties involved on the terms and conditions as well as what will be delivered by your company, as you can see as one of the tips found at https://www.entrepreneur.com/article/242226. By the time you have delivered your service or product to the customer and they still pretend not to pay or come up with silly excuses not to pay you, then you will need to keep sending them reminders to pay up. It would be great if people honour agreements and make payments after they have enjoyed the service given to them or product they received. Let’s save each other’s time and cut down on the unnecessary reminders and chasing. Another good read on this issue can be seen at http://www.businessnewsdaily.com/8246-non-paying-customers.html. 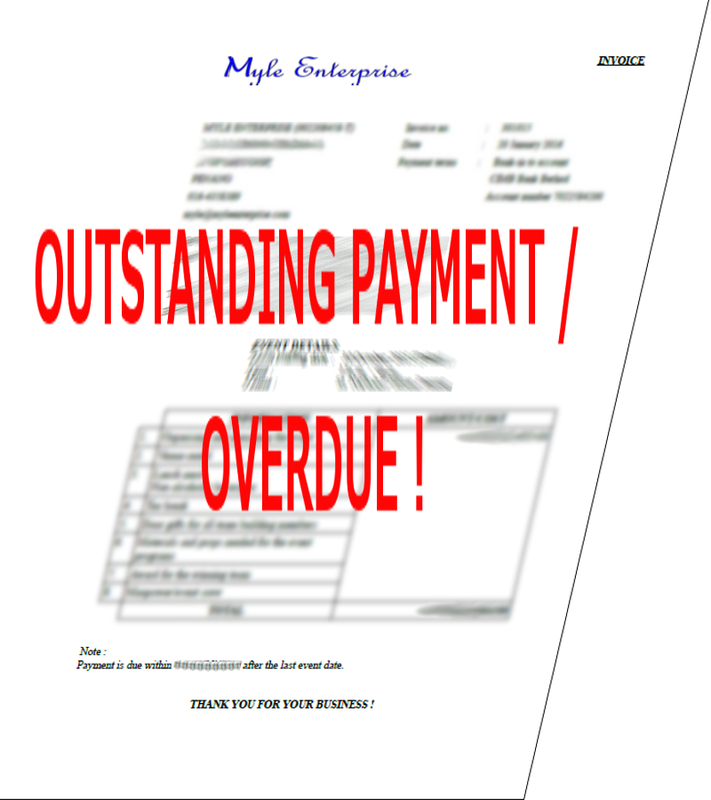 Do you have any other ways to claim what was owed to your company ? Do tell us in the comment section on what you have gone through before and your steps taken to get your payment.